Personal computer sales sank even further during the holiday shopping season, capping the steepest annual decline in PC shipments since desktop and laptop machines began to appear on people’s wish lists decades ago. The fourth-quarter numbers released Thursday by the research firms Gartner Inc. and International Data Corp. serve as the latest testament to the growing popularity of smartphones and tablet computers. The mobile devices are typically less expensive than PCs and more convenient to use than clunky desktops, making them appealing alternatives to go online for work, entertainment, information and communications. Gartner cited the mobile shift as the main reason for a 7 percent drop in worldwide PC sales from the previous year during the three months ending in December, a period when the demand for electronics is at its peak. It marks the seventh consecutive quarter of decreasing PC sales. IDC came up with a slightly different figure. By its calculations, worldwide PC shipments slipped by nearly 6 percent during the fourth quarter. 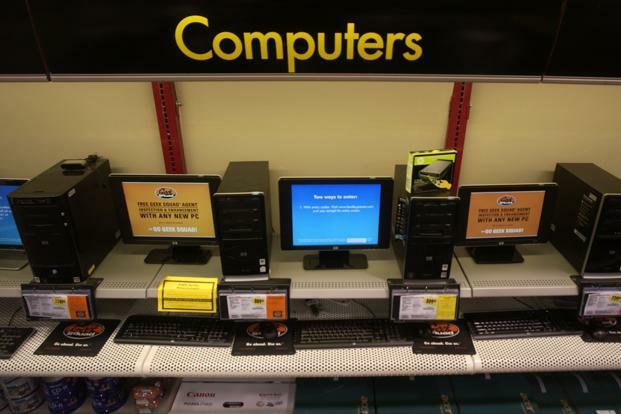 For all of last year, PC sales plunged 10 percent, according to both Gartner and IDC. Shipments of desktop and laptop computers had never slipped by more than 4 percent in any other previous year. The other annual declines occurred in 2001, in the midst of a technology bust driven by a collapse in the Internet sector, and in 2012, which marked the early stages of the migration to tablet computers. Somewhere between 314 million and 316 million PCs shipped last year, according to Gartner and IDC. That means PCs have backtracked to roughly the same level as in 2009 when the worldwide economy was struggling to shake off the Great Recession. PC sales are expected to deteriorate a little more this year, with IDC projecting a decline of 4 percent. Hewlett-Packard Co., the largest U.S. maker of PCs, had a particularly tough fourth quarter as its shipments declined by 7 percent to 9 percent from the same time in 2012, according to Gartner and IDC. That left HP as the world’s second largest PC maker behind China’s Lenovo Group, whose fourth-quarter shipments climb by 9 percent, according to IDC. Lenovo begins this year with a worldwide market share of nearly 19 percent compared to 17 percent for HP. Even though HP is still struggling, the worst of the PC slump appears to be over in the U.S., where the magnitude of the sales declines has been easing in recent quarters. U.S. shipments of PCS were down by less than 2 percent in the fourth quarter, according to IDC. Analyst Rajani Singh of IDC believes more people in the U.S. have started to replace older PCs as they have realized that they still need a desktop or laptop machine to perform many tasks, such as typing lengthy documents and creating spreadsheets. But PC makers still face challenges in less developed countries, where many people are unlikely to ever buy a clunky desktop, said Gartner analyst Mikako Kitagawa. “In emerging markets, the first connected device for consumers is most likely a smartphone, and their first computing device is a tablet,” Kitagawa said.